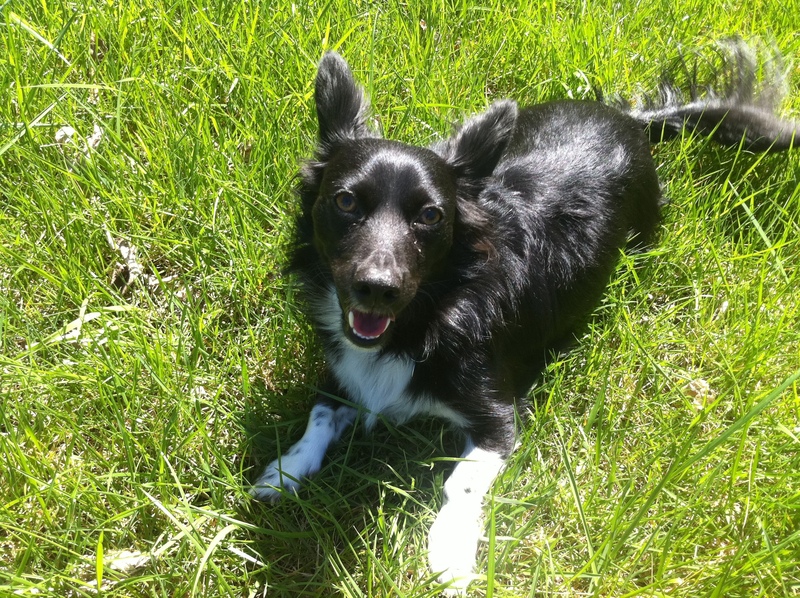 While we theorize that Loki is a corgi/border collie mix, we won’t be 100% sure unless we give in to our curiosity and send off his DNA to get tested, which may never happen. One thing is for sure though, he has different length fur in odd places. Most noticeable is his tail, which has some super-long strands interspersed with short strands all along its length. And this just in from Obvious News headquarters: it’s really hard to get a good picture of a dog’s tail, those thing never hold still! Another place with longer fur–behind his ears–is pretty characteristic for that border collie look. I noticed the other day that the fur there was looking a bit matted… oops… We don’t really brush him ever, because it hasn’t really been an issue in the past. Anyway, I attacked the poor guy with a comb (luckily he’s used to people playing with his ears) and cut off one hopeless tangle; the rest was actually salvageable. We have three kitties. They’re indoor-only. This creates a bit of a challenge in a house the size of ours… especially considering that we have a dog who thinks everyone wants to be his friend and play with him. An early decision before we even closed on our house was to make one room dog-free and one room completely pet free. We’ve had occasions when we’ve had friends who were mildly allergic to pets find themselves very unhappy when spending the night at our place. It’s also nice to have a room to go to for various projects and not have to worry about the cats getting into everything… especially straight pins, which they have a strange fascination for. I guess it’s because they’re small and shiny. Yarn is a problem too, cats and balls of yarn are cliche for a reason. We also have this cute little cat tree that we nabbed on clearance a few months ago. 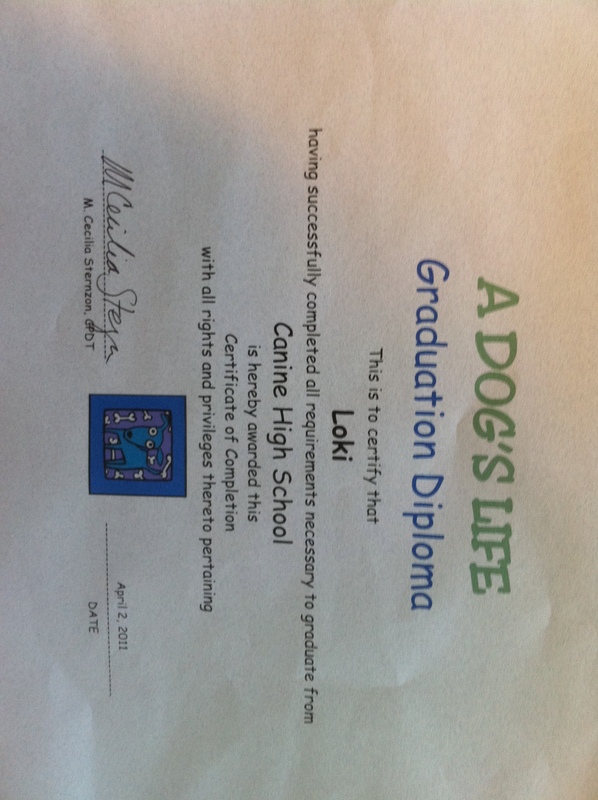 That’s right, Loki has officially made it out of high school. I guess this means now he’ll have to go out and find a job. Haha, I kid, he’s totally going to be a sports star, which is why his next class will be “Obedience for Dog Sports”. He still hasn’t gotten a lot of the tricks he was supposed to learn in high school (“spin” and “roll over” both freak him out. It’s kinda weird.) but he heels fairly well, and his sit-stay is getting really, really good. Dave actually managed to get him to stay while Dave backed up halfway across the dog park and then called him over. Now granted, this was after Loki had gotten tired of playing with the other dogs… but still, pretty impressive! I figured I’d actually try to get a good picture of him for once… Poor dogs with black fur don’t photograph so well.